Ask any marketer what the difference between B2B and B2C marketing is, and chances are they’ll say that that the B in B2B stands for ‘boring’ while the C in B2C stands for ‘creative’. Broadly speaking, B2B marketing sells products from businesses to other similar businesses, who then might sell them on to consumers. B2B marketing has traditionally focused on the facts. It has revolved around logic, not emotion. Its job has simply been to get a transaction across the line, often to a customer who would have bought from them in the first place anyway. 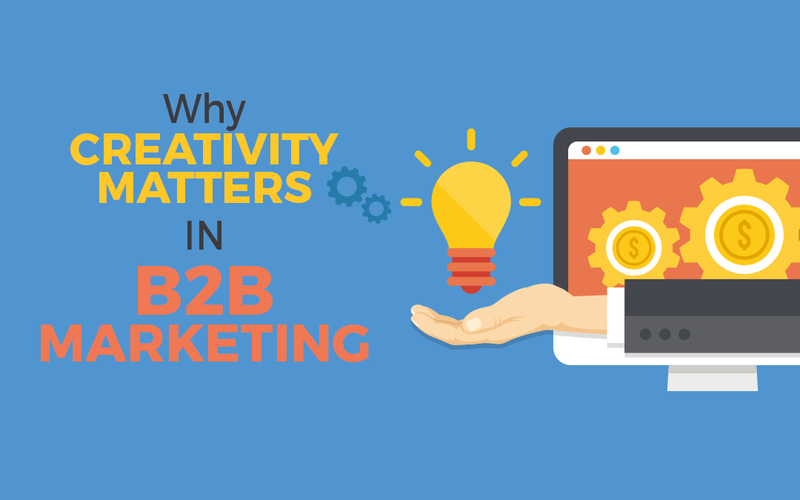 So why is creativity becoming more and more important in B2B marketing? Simply put, we’re all consumers now. All forms of marketing – particularly video – have increasingly become more creative and consumer-driven. Even if our business is strictly B2B, we’re still all consumers at heart. We know what appeals to us as a consumer. We’ve all got our favourite ads, and we know which ones will make us fill our garages with Audis and our bellies with KFC. In the same way, then, the second ‘B’ in a B2B relationship (the business buying the product from another business) is really a consumer. Businesses aren’t selling to businesses, they’re selling to human beings who make decisions for the wider business. And because those humans are so used to seeing entertaining advertising outside of work that hooks them in and makes them want to invest their hard-earned cash into that Audi or that quarter pack, it makes sense to add a spice of creativity to B2B marketing too. Of all the marketing tools that are available, video is the one that’s most consumer-driven – specifically an animated explainer video. It’s designed to appeal to all the natural instincts of a consumer: humour, sympathy, fear, security. A well-crafted video answers a consumer’s problems, often before they’ve even realised they have one. And a great video has the ability to make even the driest, most boring content sound exciting and entertaining. When it’s compared with B2C, B2B is typically unexciting. Add to that the fact that many B2B products would be purchased with or without big marketing spend and you’ve got all the ingredients for an unexciting marketing recipe. But just adding video to a B2B marketing campaign has the ability to boost interest and intrigue. Appealing to the humans behind the business who have control of the credit card will always pay off more than sticking to the status quo. You’ve probably heard the saying ‘if you always do what you’ve always done, you’ll always get what you’ve always got’, and while there might be some truth to it it’s not always easy trying to change a well-engrained mindset. Still, if you’re keen to give an animated explainer video a go and see how it could transform your B2B mindset, contact the friendly Onepost Media Production team today – we’ll help you out.